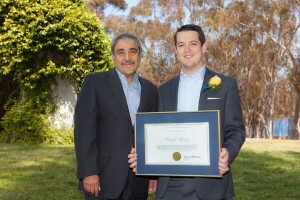 Congratulations to this year’s recipients of the UC San Diego Academic Senate Distinguished Teaching Award. The prestigious award is bestowed upon faculty and graduate students to honor teaching excellence. Recipients are selected for their creativity, innovative teaching methods, ability to motivate students and commitment to teaching. At the annual awards ceremony today at the Faculty Club, Chancellor Khosla congratulated each awardee and commented that it is because of our amazing achievers – like our honorees – that UC San Diego has become a world-renowned public research university in only five decades. Prof. Mercier is the first faculty member in Electrical and Computer Engineering to win this award since Jack Wolf won the award in 1999.